Learn how to make your very own hand tied bouquet using beautiful seasonal British blooms and fabulous wild natural foliage. Includes a glass of wine. What will the workshop cover and how will it be taught? You’ll learn how to prepare and condition your stems and under the guidance of Green House Floristry, you’ll explore colour and texture whilst creating your own unique bunch. The evening will be finished off with beautiful wrapping techniques to get your flowers home to show your new found skills off to everyone! 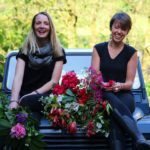 Ashley & Michelle own and run local floral studio Green House Floristry, known for their wild and seasonal floral work and passion for sustainability within the floral trade as well as their love for unusual colour combinations and masses of textural quality. Last year’s Christmas workshops were such a success it’s great to welcome them back for some summer creativity.